Reserved until July 3 ? The last reservation of this item will conclude on July 3. For rentals that require shipping or a pickup at a non-headquarter location, please select a later date for your arrival. Headquarter offices are the only locations that can accept a same-day reservation, as transit time is not calculated in this date. 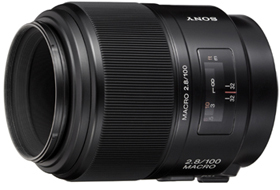 The Sony 100mm f/2.8 A Mount Macro Lens focuses just over a foot away from your subject with a 1:1 reproduction ratio which means your small subjects will appear life-size. The fast f/2.8 aperture helps in darker conditions. It sports a couple of features to enhance control over focus: an auto clutch manual focus ring will keep still when in AF mode so that you don't lose your focus and a Focus Hold button and Range Limiter gives you superior focus performance and control. This lens is ideal for macro photography and is also great for portraits. This lens is compatible with both APS-C (crop frame) and full frame sensor Sony Alpha A Mount camera bodies. It is not compatible with NEX cameras or full frame E Mount cameras.